I first met with Arci in Vasto in 2009 on BittaGeneration workshop. There were plenty invites during the last 6 years to come back but living a dream of corporate slave (being full time designer, steady job, 8 till 5, paycheck at the end of the month) and than working on my Magister thesis and being reborn as visual artist/painter/ronin took some toll. 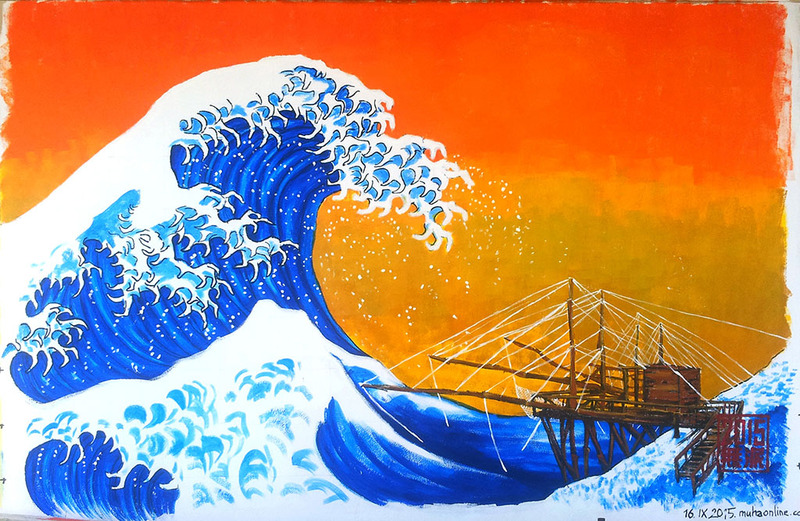 So, this time, I wanted to make it count, one Great Wave for Vasto, and one large polyptych painting for Arci Offices (Abruzzo, Chieti, Fossacesia and Vasto). Since 2009 our main target has been to create art to raise awareness of implication of oil rigging in Adriatic sea. 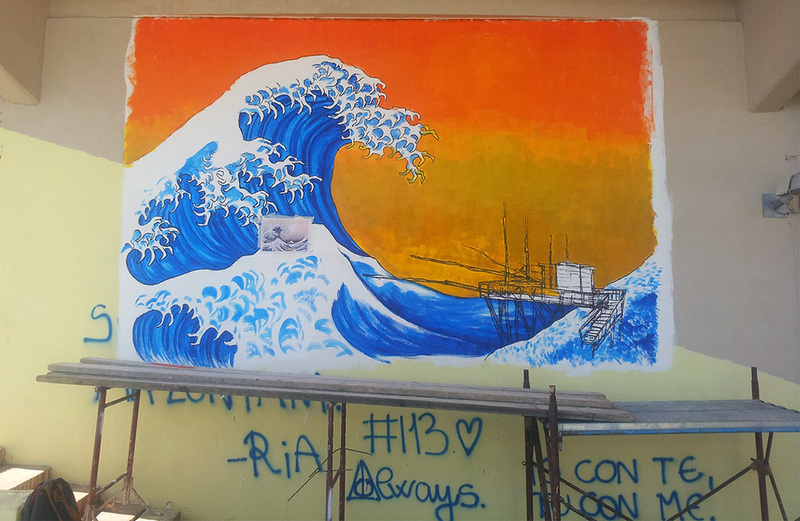 I have made proposal of the Great Wave of Oil for the wall in Vasto but municipality government found it very dark. I was also unaware of genius loci of the wall of Vasto Arena delle Grazie. It is a dark corner very near the promenade that surrounds old city and fort, where kids have a smoke during a day, drunks and junkies gather at nite, men in need pis on its wall and dog owners take their pets to dump their little Mr. Hankey´s . Painting something dark and murky in this place would probably cause a raise of suicidal tendencies in Vasto. So I had to do something cheerful, bright and colorful to change the spirit of the place. And when I think of the spirit of Abruzzo region, trabucco comes first in my mind. These fishing platforms, spider like constructions, with raw joints, tide ropes, nets and uneven pathways, decorate coastal line of Abruzzo. Old as the Great Wave itself, they are reminder of life lived in connection to nature, to sea. So I decided to put this two in frame, to witness each other. I have softened parts of the Great Wave crest, cut his claws, gave him more organic feeling while, in contrast, I tried to present trabucco as it is, weird architectural construction, as human intellect, but still in contact with nature, warm, not cold. I have concentrated my painting in only one section of the wall, while other parts need to be painted white and than painted over by the kids from the Youth Center Consulta Giovanile Vasto. While painting, I was thinking (as I always do while painting) about Italy, Bosnia and Herzegovina and relations between them. I saw Italy as a distant future of Bosnia, family related mafia controlled country, government implied censorship, where government is there to drain you in any possible way, and as long as you can avoid it, you are safe, or chose easy way and become a part of the corruption. But we will always lack Italian need for beauty, for the Art. We like to destroy old to create new one, older. And than I looked back at Italy, at trabucco. Trabucco is a system of the net fishing where the fish swims into net, following the sea currents and than it is picked up easily by fishermen. And the way I see it, if the fish didn´t follow the current, it wouldn´t get caught so easily. And when I look at people from my generation, or older, or younger, most of us started as rebels, rebels that said “lets not swim and follow this current, let´s make it our way”, and as time passes, more and more fish found it hard to swim against current, outside of main cluster, giving up, finding them self caught in trabucco nets, saying “well this is not so bad, this is how my grandfather died, it is tradition”. So those who swim outside of the cluster, against the current, they must be a great wave. And I see Arci as those fighting against the comfort of “tradition”, riding in the crest of the Great Wave. 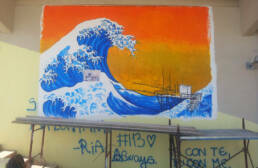 Related post: Youth Centres and youth inclusion: creativity and artistic expression in Vasto, Italy.